How to Improve Your Health with One Drink – HEALTHY LIVING. How to Improve Your Health with One Drink. It seems everybody has their favorite “super food” these days. Of course, there’s kale, avocado, acai berries, chia seeds and dozens of other foods known for their abundance of healing and nutritional properties. Chaga mushrooms grow on the trunks of birch trees, typically in colder climates within the Northern Hemisphere. They look like dark, scorched knobs protruding from the trees and have a lovely, woody taste with an almost sweet, vanilla-like finish. Always made in tea or tincture form, the chaga mushroom contains anti-inflammatory, antiviral, antibacterial, anthelmintic (anti-parasitic), antifungal and even antitumor properties. All of these properties help your body ward off undesirable pathogens while simultaneously healing and regulating itself. 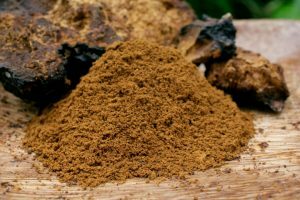 Chaga is also a great source of phytonutrients, enzymes, many of the B vitamins, vitamins D & K, and minerals like iron, calcium, potassium, copper and zinc. As if all of its other healing properties aren’t enough, Chaga also has one of the highest antioxidant levels of any food yet discovered! (As a reference point, you would have to eat 3 pounds of blueberries, another super food, to get the same amount of antioxidants one cup of chaga tea contains). This is extremely significant as antioxidants boost your immune system, keeping you healthy by protecting cells from free radical damage. As an adaptogen, this mushroom helps the body adapt to stress. It does this by supplying energy to the systems that need it and calming those systems that are overworked. This creates a sense of physical homeostasis which leads to mental relaxation. One of the liver’s main fuctions is to filter out toxins and excrete waste material. However, it can only do this if a sufficient amount of bile is produced. (Moritz, 2006). Chaga stimulates this production of bile, ensuring that your liver, and consequently the rest of your body, runs smoothly and efficiently.